A few years ago, we started a Thanksgiving table runner. This could be used for any holiday, though. 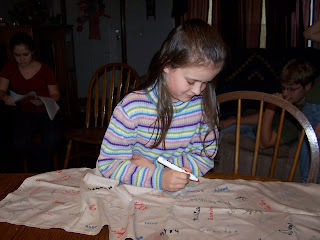 We had everyone who ate dinner with us sign it with a fabric paint pen. We started using a different color for every year, but we ran out of colors! (they need to make more!) So this year, we had to write ’07 under every name. The kids think long and hard about where to sign their names. You can see a lot of it in the pic. We started this in 1998, i believe, either that, or 1999. I can’t remember at the moment. lol So a few signatures are “scribbles” where the youngest wrote their names. We did write their names under that, so we could tell whose scribbles where whose. lol It’s so fun to sit at the table and look at how the kids signatures have changed over the years. You could use a tablecloth or a table runner like we did. When our runner is full, I plan on starting over with a tablecloth. Having a special Thanksgiving tablerunner Works For Me. Next PostA Year of Free Movies and Popcorn! fantastic idea! love the picture!